Look no further, we’ve got you covered right here with this delicious Balsamic Glazed Roasted Beets (with pistachios and pomegranate seeds) dish. 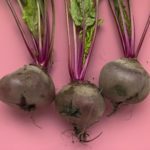 Beets are great for us for a number of reasons- like for example they’re a source of anti-inflammatory compounds like anthocyanin, and they’re also a source of various vitamins and minerals like energizing b vitamins, magnesium and manganese. Research also suggests that beets are a great to boost your stamina to help exercise longer, improve blood flow, and help lower blood pressure. Top these roasted beets with a balsamic glaze, pomegranate seeds and pistachios for the best flavor! 3 pounds beets – scrubbed and cut into wedges not more than ¾ inch thick. If you prefer not to eat the peels, peel with a vegetable peeler before cutting. Toss beets with olive oil, balsamic vinegar, cumin, fennel, salt, pepper in a bowl and coat well. Place on parchment lined baking sheet and roast until fork tender, stirring every 15 minutes, about 45 minutes. Make Balsamic Glaze by adding ingredients to a small sauce pan on medium low heat, and reduce 20 minutes or until you have about 3 tablespoons. When beets are cooked, plate and toss with the balsamic glaze, and sprinkle on pomegranate seeds and pistachios. Add a dash of orange zest if desired. Want more veggies and sides? Click here!